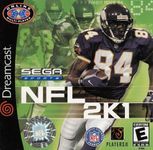 NFL 2K1 is the sequel to NFL 2K, Sega's first NFL game for the Sega Dreamcast. The game was a major title for the Dreamcast and one of the few games to sell enough copies to make the Sega All Stars list of budget games. This was the last Dreamcast exclusive NFL 2K game.